LANIKAI – VIEWS VIEWS VIEWS! 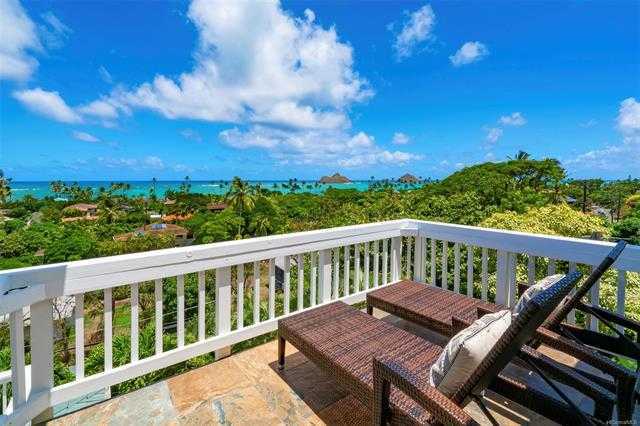 Unsurpassed 180 degree views of crystal blue waters & the Mokulua Islands! This home features a Main House+Guest House. Main house has 2 Master Suites. 3 Bedrooms have a private lanai. Views from nearly every room in the house. Master Ste in the main house w/separate entry & Guest House offer great investment opportunity. Large entertainment deck ideal for entertaining. Photovoltaic System & Solar Water Heater. Situated on a cul-de-sac. Lots of parking. Porte Cochere has space for 5 cars from Koohoo Pl.,& 2 car Garage accessible from Aalapapa Dr. Perfect home for multi-generational living or investment. 2 minute stroll to white sandy beach. Enjoy all that Lanikai has to offer-Hiking, swimming,sailing,paddle boarding,kayaking,or simply relaxing on the beach. Please, send me more information on this property: MLS# 201824220 – $3,710,000 – 1006 Koohoo Place, Kailua, HI 96734. I would like to schedule a showing appointment for this property: MLS# 201824220 – $3,710,000 – 1006 Koohoo Place, Kailua, HI 96734.